Back to Glacier National Park in Montana for our second visit this trip. Sadly for us the weather didn't really play ball for us this time either. Smoke from the forest fires in California made the views hazy and we had rain each night. HOWEVER!! We did do a couple of FABULOUS hikes. And this is surely the place for it! So much good hiking and with our now tight-ish timetable we really only had time for a couple - it was a tough choice! 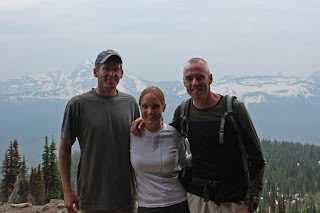 Monday we hiked the 11.5 mile Highline trail. This is my kind of hike. Due to the (free!) shuttle service running throughout the park we were able to start and finish at different spots and meant that we had a 200ft elevation gain on the first 7.5 miles, followed by a 2200ft downhill to the trail end! Apart from it being pretty easy going we saw billy goats and big-horn sheep up close, we were wrestling with the goats for trail rights!! Thankfully no grizzlies (check out Chris's hand compared to one of theirs!! - and kids the world over take bears to bed and cuddle?! - sheesh!). Whilst waiting at the bus stop for our shuttle to the start point we met Jeff the Geologist. He was from Helena, Montana and has spent oodles of time in Glacier - as a Park Ranger in his youth. We hiked with him the first 7.5m as far as Granite Park Chalet and had a great time chatting away about this, that and everything. So enjoyable to hike with someone new. Not that Chris isn't charming company, but...well you can imagine!! Thanks Jeff - we'll be looking you up for your guided hiking services next time we're in Montana!! Today we hiked 9 miles to Iceberg Lake. With every other man and his dog (Actually I was kidding - no dogs - but they would make great bear bait...) Despite the grey, miserable start to the day the sun won over eventually. Again a pretty easy going hike, but the closer you got to the lake the chillier it got - all that snow and ice around?! And curiously enough the lake was full of icebergs - well I never...!! Very cool. Literally! A quick stop for lunch and the hike back again. We were surrounded by prime bear habitat, no sightings for us today. Mostly that's a good thing!